I haven’t read this so tell me all about it please. It’s amazing! I love it ! This book is simply ace. I read it and thought how lovely it is, because it just left good memories, of how Selma became quite friendly and how she (with Tina) made cute little cupcakes at Tina’s house. I’d definitely recommend it to others. Epic it’s a must read!!!! I don’t like this book I love it. I say it is 5 star material. Ithink butterfly girl is going to be really intresting because all of her books I read are are intresting because it gives me detail about the and it makes me want to read it every time . Even if I haven’t read butterfly I know its going to be intresting. I love this book! i couldn’t put it down (much to my friend’s annoyance!) i love how Tina relies on her sisters, her relationship with Selma and Mrs Lovejoy. i loved realizing that Ruby and Garnet from double act were hidden in this book, and are very much the same sort of characters, are still together and get along! 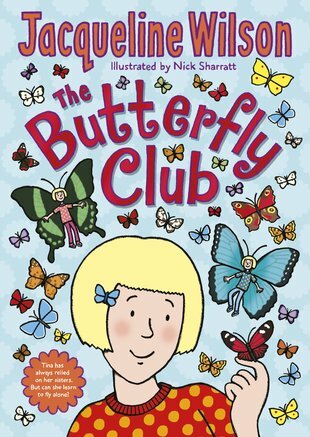 I loved the part when Selma stuck the paper butterflies on the plants, and it was sad when they all got soaked! i love Tina’s passion for butterflies! the funniest bit was her Granddad’s naughty apron! i finished this book in 3 days and i am tempted to read it again, although i have a stack of other books waiting to be read! i thoroughly enjoyed this book! I really enjoyed reading this book. It is a great book on friendship and shows why bullies might bully and how to try and make friends with them. Overall I think this is one of jaqueline wilsons best stories. I don’t think the story needs to be improved as it is well told.